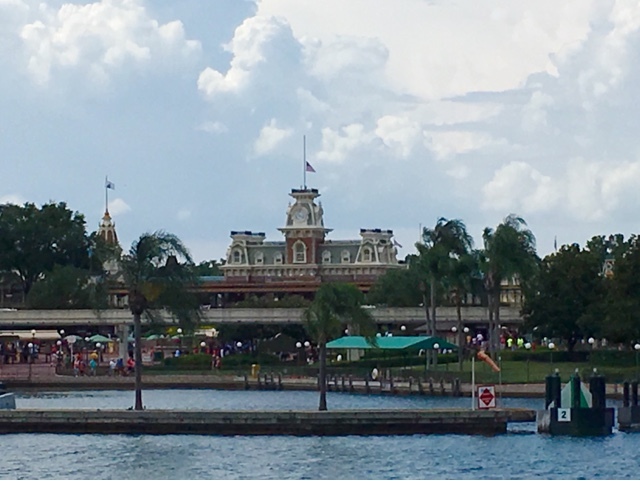 I took this Magic Kingdom photo while standing on the small bridge between the area in front of the Adventureland entrance and Liberty Square. The building is the back of the Jungle Skipper Canteen restaurant. If I were to turn around, I'd be looking toward Cinderella Castle. 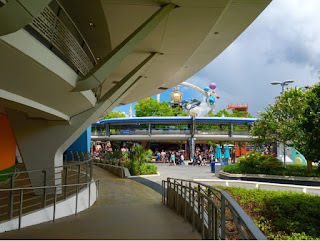 Tomorrowland is a good mix of nostalgic and new attractions, as well as one of the best thrill rides in the Magic Kingdom. I was standing near the exit of Carousel of Progress when I took this shot. You can see Rocket Tower Plaza in the distance, along with the PeopleMover. Here is a photo of the entrance to the busiest theme park in the world. The only way to get this shot is from a boat on the Seven Seas Lagoon. I was on the Richard F. Irvine ferry boat when I took this one a few weeks ago. 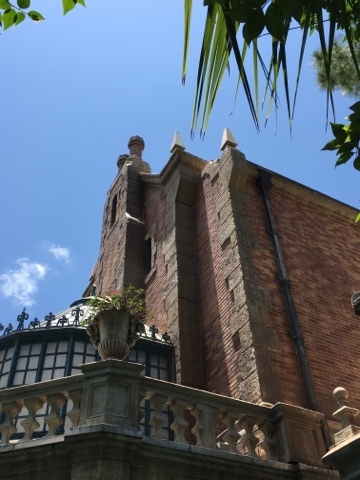 As I've mentioned in the past, Haunted Mansion is my favorite attraction. It isn't easy to take indoor photos, because of the darkness. However, I try to take as many outside shots as possible. I took this one last week, while waiting for my tour guests at the exit. The Barnstormer is a fun, albeit short, kiddie coaster. It is based on the mishaps of the Great Goofini, who is a circus performer who is prone to accidents. This billboard has a large hole where the "airplane" coaster flies through. 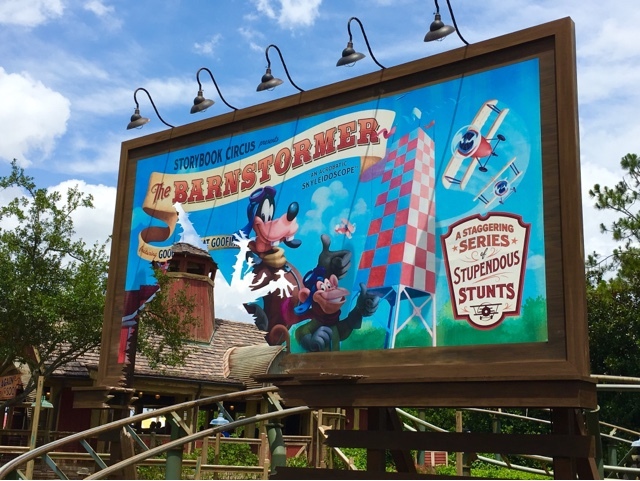 If you look closely at the lower plane on the right side of the billboard, you will see a hidden Mickey in the center of the propeller. The Be Our Guest restaurant is still one of the most popular in the Magic Kingdom. The details are plentiful both inside and out. I took this shot of a gargoyle on the bridge last week while giving a tour. This portrait can be found in the lobby of Hall of Presidents, just to the right of the entrance to the theater. Of course it is significant because it features our first president, George Washington. However, it also contains a little detail that most guests overlook. If you look closely, you will find a hidden Mickey at the very bottom of the sword sheath that he is holding. Mickey's Philharmagic is one of the best 3D shows on Disney property. It concludes with Donald Duck falling through the back wall into the gift shop. 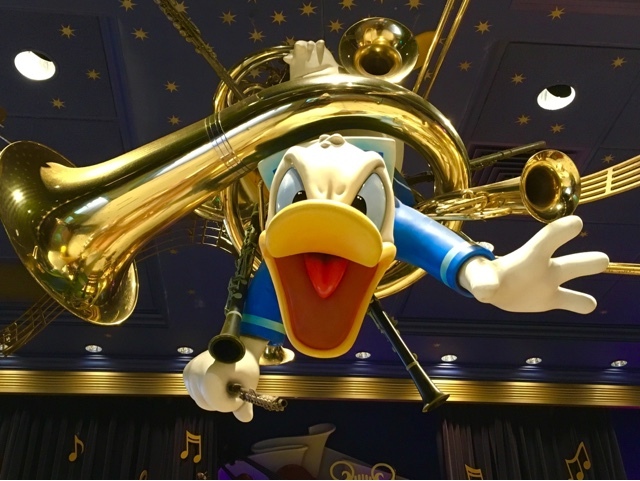 After exiting the show, you can see the angry Donald hanging from the shop ceiling. 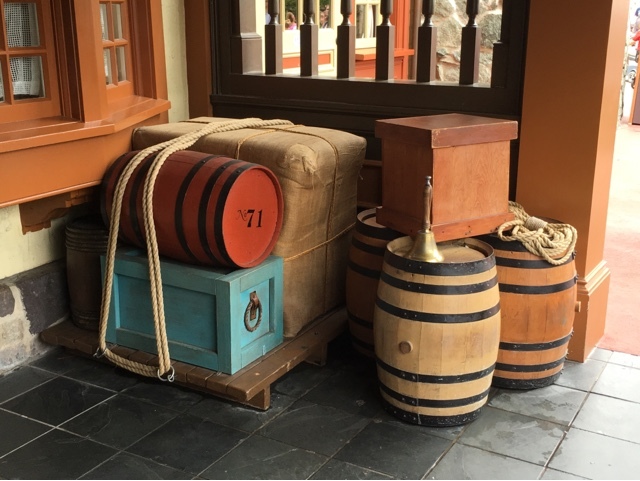 Pirates of the Caribbean is a classic attraction with endless details. 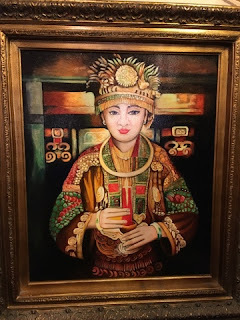 One of my favorites is the hidden Mickey that can be found in this portrait, located near the exit of the attraction. If you zoom in on her left shoulder, you will see the classic Mickey. I always try to frame my photos with natural surroundings whenever possible. The trees in this shot helped me do just that. 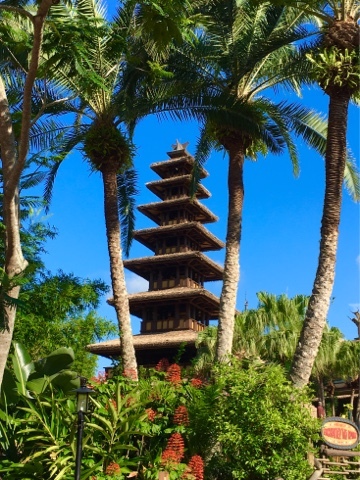 I was standing near the entrance to Jungle Cruise when I took this picture of Walt Disney's Enchanted Tiki Room. Splash Mountain is one of the longest Disney attractions and it contains some of the best details. You will find references to fictitious people and companies throughout. 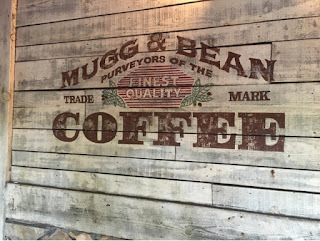 This sign for "Mugg & Bean" coffee can be seen in the exit area, just pass the photo viewing screens. 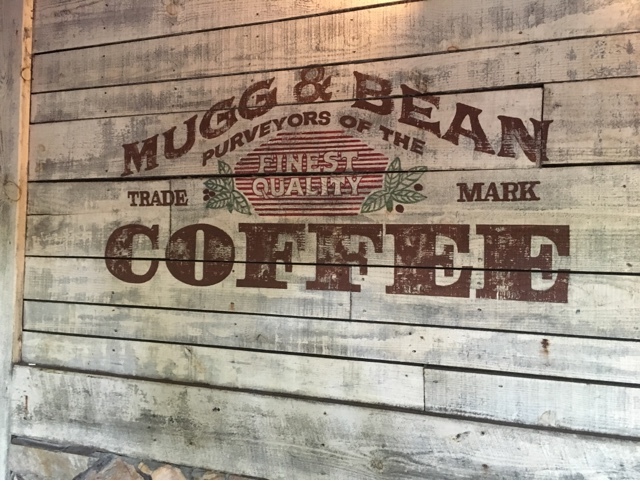 Frontierland is one of my favorite sections in the Magic Kingdom in the early morning, when very few guests have made their way to that area. 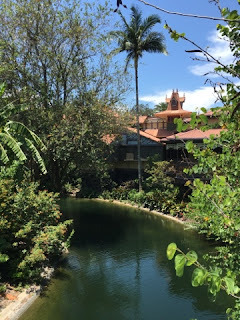 I was waiting for my tour guests at Thunder Mountain when I walked down to the bank of the Rivers of America. 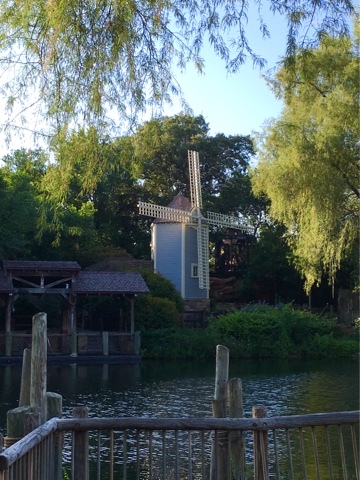 This is a shot of Potter's Windmill, which can be seen across the river on Tom Sawyer Island. 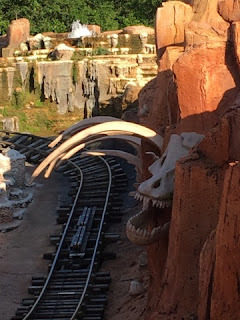 As I've mentioned in the past, I probably have taken more shots of Big Thunder Mountain Railroad than any other attraction. There are so many great photo opportunities in and around this coaster. I took this one of the dinosaur bones yesterday morning, while peering through a crack in the rocks. 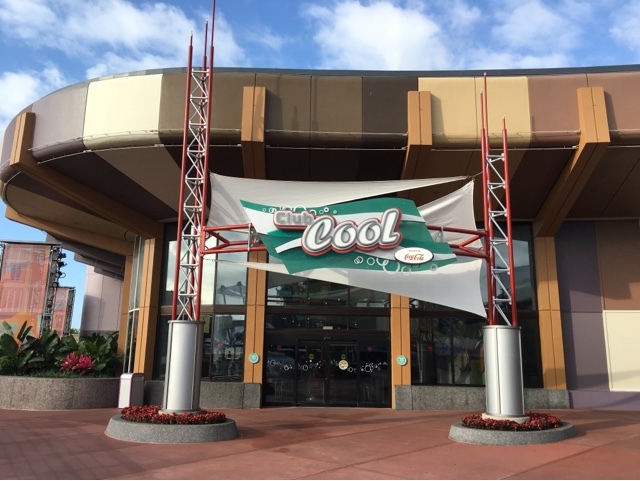 Club Cool at Epcot is a fun spot to sample free soda from around the world. It is particularly popular on hot summer days. Most of the offerings are tasty, but the Beverly flavor from Italy will surprise you, the first time you try it! 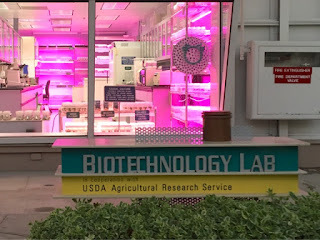 Here is another shot from the Living with the Land attraction at Epcot. 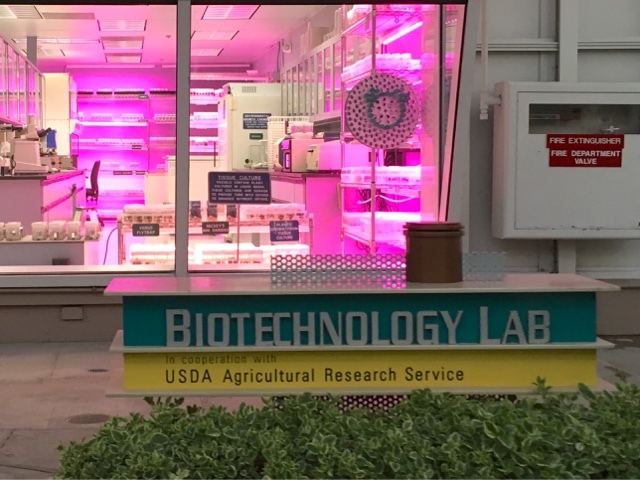 This is the biotechnology lab that can be seen toward the end of the greenhouse section of the ride. If you look closely, you can see a hidden Mickey made from test tubes. Here is another shot from Disney Springs. This is one of the main entrances to the complex. 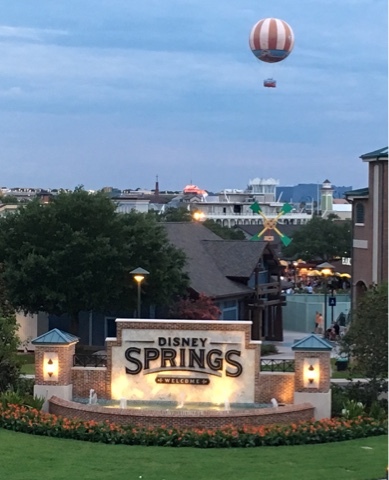 You can see the Characters in Flight balloon in the background. I took this shot while crossing over the bridge that connects Disney Springs with Hotel Plaza Boulevard. One of my favorite quick service restaurants in Magic Kingdom is Columbia Harbour House. The food is good and I love the theming. These crates and barrels are right near the entrance. I like the number "71" painted on one barrel, which is a reference to the year this park opened. 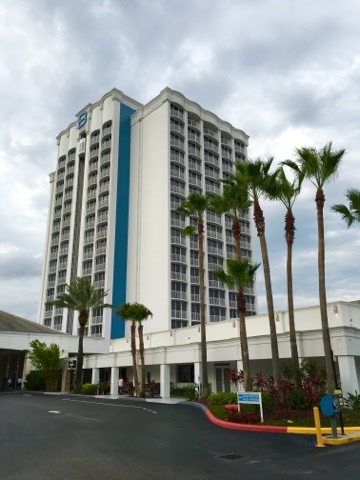 Tonight, we have the pleasure of staying at the B Resort. This is a very nice hotel within walking distance of Disney Springs. Our room is on the 9th floor, and the views of Illuminations and Wishes were great. The Grand Floridian has several great pools, as well as a fun water play area for kids. 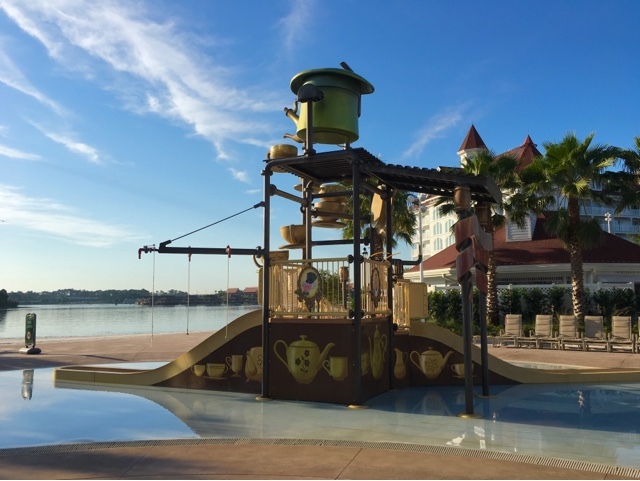 This spot is themed to the Mad Hatter, and is the perfect place to cool off on a hot day. I took this shot in the early morning, when it was stil very quiet. 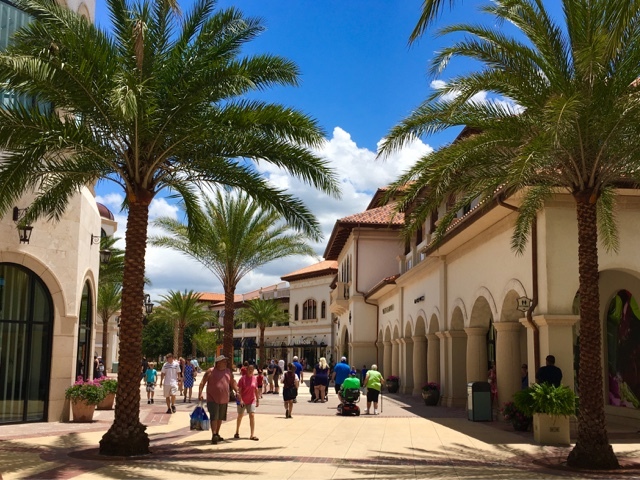 Here is a another shot from the new Town Center area of Disney Springs. 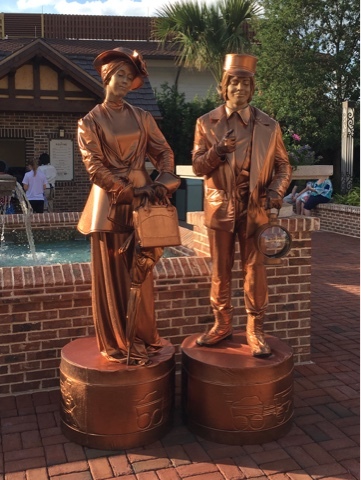 This appears to be two copper statues. 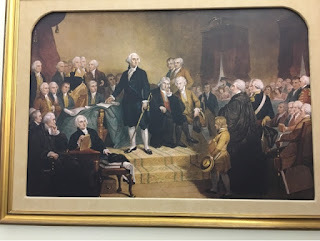 However, every so often the would move, revealing that they were actually people. Crowds gathered and many guests took pictures with the pair. Walt Disney's Carousel of Progress is the only attraction currently at Walt Disney World that Walt himself actually worked on. It has been around since the 1964 World's Fair, and is the longest continuously running theater show in American history. Although little has changed in this attraction in many years, they have decided to add a new paint scheme to the exterior. I took this panorama today while my tour guests were inside enjoying the show. 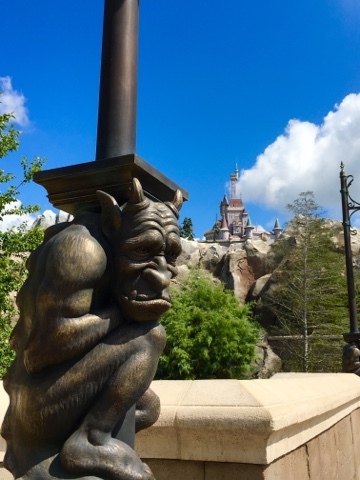 Disney recently debuted a "personalized" message area at the end of a few more attractions. I mentioned small world and Haunted Mansion in a previous post. 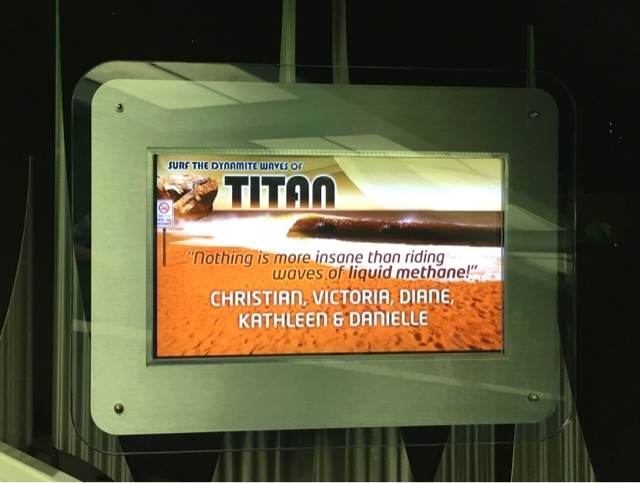 Now, the exit areas of both Mission Space and Space Mountain display the names of guests passing by on video screens. Today, I took this shot as I was ascending up the exit ramp of Space Mountain with my tour guests. 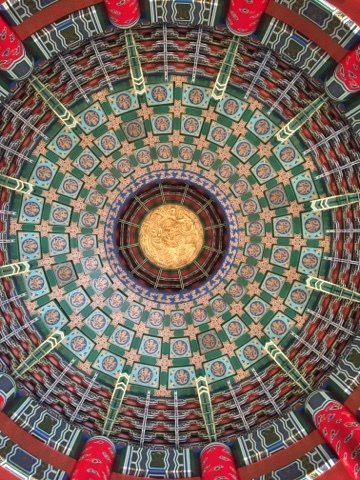 The China pavilion at Epcot is home to some of the most ornate buildings in this park. 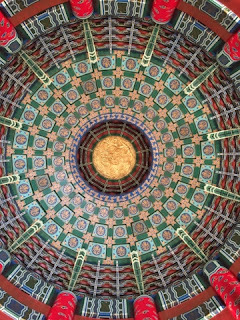 I took this shot from inside the 1/2 scale replica of The Hall of Prayer for Good Harvest. I was on the floor, looking straight up at the ceiling. 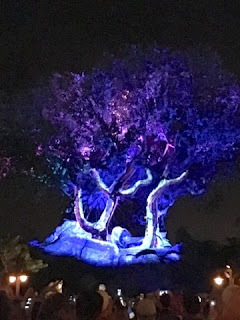 As part of the new nighttime offerings at Animal Kingdom, the Tree of Life has new projection shows right on the surface of this giant structure. 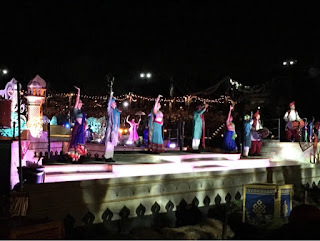 There are several different "awakenings" that take place throughout the night that are accompanied by music. Also, in between each display are smaller snippets of some of the carved animals on the tree "coming to life." It is very impressive and definitely worth checking out during a nighttime visit to this park. 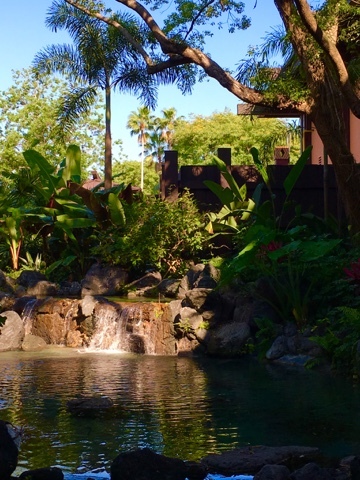 There have been many renovations and refurbishments done at the Polynesian over the last few years. Most have been in or around the Great Ceremonial House. This is the waterfall area to the left of the entrance, which I photographed a few weeks back. Here is another shot from my visit to Disney Springs last week. This is right down the middle of the new Town Center area. These buildings contain many new shops, and there are still more to come. 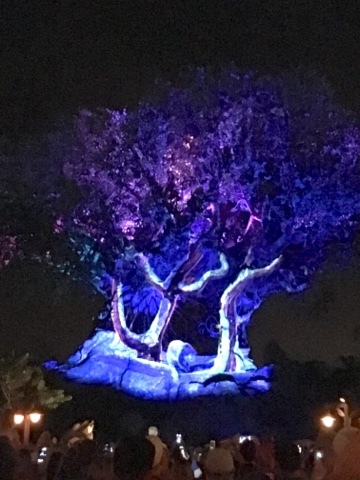 Tonight, we had our first opportunity to see the new Animal Kingdom show, The Jungle Book: Alive with Magic. 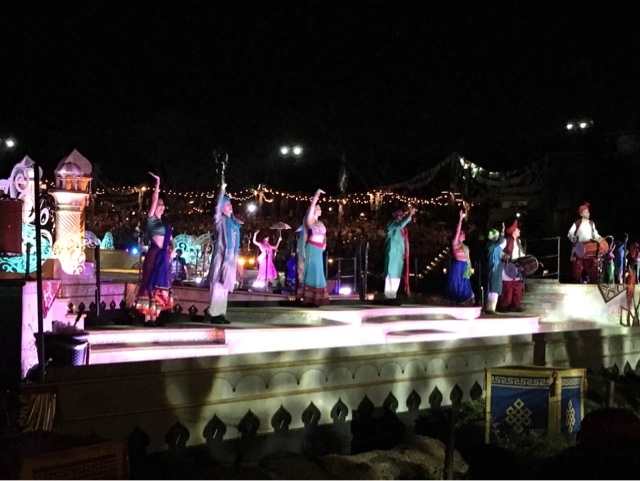 This impressive production takes place in the new theater, built on the banks of the Discovery River. It includes giant water screens, live performers, and great music from the movie. As we were leaving Epcot last night, I turned around to see this view of Spaceship Earth. 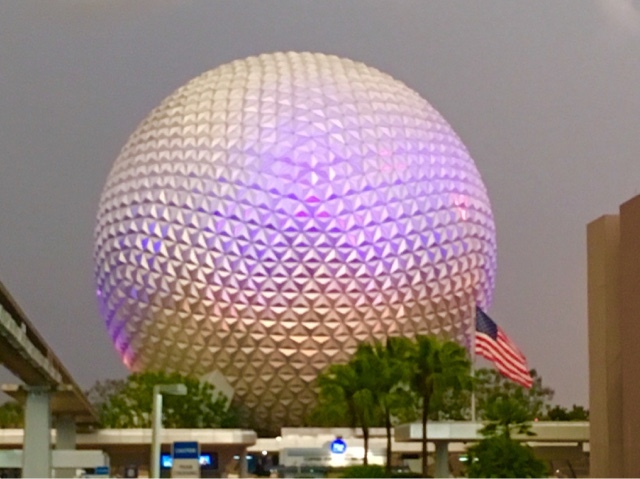 A strong storm had just passed, and the dark sky provided a nice contrast behind the giant "golf ball." Also, the colored lights showed up nice on the metallic triangles.